I love busting myths about the city in this feature, but myths about owning vs. renting, the international nature of DC’s residents, and how no one is from DC would be impossible to bust without cold hard data. And where do we get that data? The Census! And now is an exciting time– Census forms should be arriving this week, and now you get to do your civic duty and fill out your form. There are a lot of myths about the Census– who should fill it out, what the information can be used for, etc– and this is the first time that many of us are the heads of households filling out these forms. Lucky for us, we’ve got Maurice Henderson, the director of DC Counts, to help us bust this week’s Census-related myths. Check out what Maurice had to say about three big myths Census myths. Myth #1: I’m a college student living in and attending school in DC, but I’m still technically a ‘resident’ of another state, so I shouldn’t fill out the Census form mailed to my college address. “The Census does not ask about legal residency, it only asks about where you are living most of the time. College students living in DC for school on April 1, 2010 should be counted in DC. This will not affect your voter registration, driver’s license, in-state/out-state tuition status, or anything else. The Census Bureau does not share personal information with any other government agency. The reason students should be counted where they attend school is because they use local services here in DC. Each year, the Federal Government administers billions of dollars of funds based on census data for things college students use frequently, such as public transportation. Myth #2: I’m not in this country legally, and filling out the Census would reveal my location/status to the authorities. “Absolutely not. The Census Bureau does not share your personal information with any other government or law enforcement agency. The Justice Department recently ruled that the Patriot Act does not trump the Census Bureau’s confidentiality rules. Furthermore, the US Constitution specifically calls for enumeration of all residents (not just citizens) of the US, regardless of legal status. This has been the case since the very first Census in 1790. Undocumented immigrants should fill out the form for the same reason as college students – they live here and they use services. Myth #3: We don’t have congressional representation, so the Census doesn’t affect anything in DC. “The Census isn’t just for representation. It provides a vast set of statistical information for all kinds of programs and projects. Each year, the federal government administers more than $400 billion based on census data. The Brookings Institution broke down the data for fiscal year 2008, and DC’s share was $2.7 billion – or $4,656 per resident, per year. That’s a lot of money. Additionally, private businesses use census data all the time for marketing and business expansion. If people want a new coffee shop or grocery store in their neighborhood, those businesses need to know where potential customers live. The best way to get involved is to fill out your form and send it back – and encourage your friends and neighbors to do likewise. Participate in the “Portraits of DC” photo contest. Interact with the DC Counts campaign via social media – find us on Facebook, follow us on Twitter (@DC_Counts), or check out census.dc.gov. Attend the National Census Day rally, hosted by Congresswoman Norton, at Freedom Plaza on April 1st. More details coming on that soon. Keep an eye out for volunteer opportunities for census outreach, particularly on April 10th! The U.S. Census Bureau is planning to hold a final canvassing push called “March to the Mailbox” on that day. This will be potentially hundreds of people heading out in various neighborhoods in the District based on the rolling response rates to more strongly encourage their family, friends and neighbors that may not have filled out the form to do so. More details will be forthcoming soon. For census jobs, you can call 1-866-861-2010, or visit the Census jobs site. Many thanks to Maurice Henderson for being this week’s honorary mythbuster. 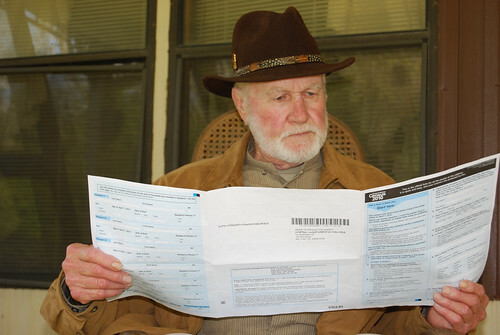 Now go home, check your mailbox, and return your Census form this week! I got mine in the mail on Monday and dropped it in the mailbox this morning. I received my Census form today, and have already mailed it back. It really wasn’t as long or complicated as I thought it was going to be. Was it 2000 when they had two forms, the short and the long one? Michael, the Census recently discontinued use of the long form (it used to be mailed to 1 out of 6 households in previous Censuses). Starting in 2010 everyone gets a short form, and the more complex data is gathered through the American Community Survey, an on-going survey asks those detailed questions. I have a question about filling out our form — maybe Maurice can help? I am living in a house with 3 other roommates on the 1st through 3rd floors. In addition, our landlord lives in the basement apartment, which is completely separate from the rest of the house. Do we all fill out one form together, or do we need to fill out two separate forms — one for the basement apt, and one for the house upstairs? Each census form is mailed to a specific address. Some apartments are considered their own address, and some are not. So, if the upstairs apartment (with the roommates) and the downstairs apartment (with the landlord) each received separate forms, then you should fill both forms out as separate apartments. Now, if the entire house only received one form in the mail, we want to make sure that everyone in DC Counts. You can either include everyone living in the house on one form (and list the relationship as “housemate” or “roommate”), or the apartment that did not get a form can call the Census Bureau’s Telephone Questionnaire Assistance Center at 1-866-872-6868. They will make sure to get a form to an address that they might have missed. I hope this answers your questions! Check with your landlord to see if they got a form in the mail, too – we want to make sure that everyone counts in DC. 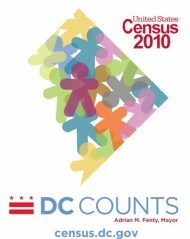 Also – if you have any DC specific questions on the Census, you can call us at DC Counts via 311 or 202-724-4897.